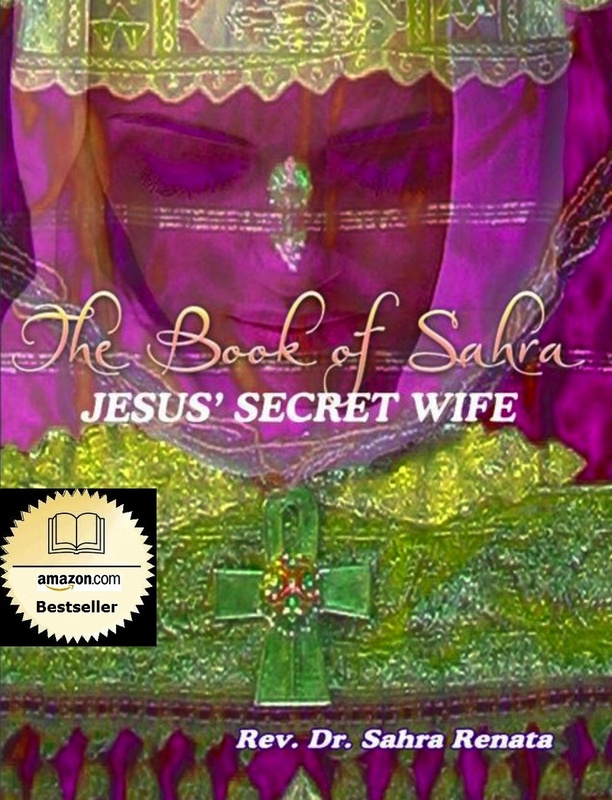 When the opportunity arose for me to have a chat with the English born author who recently finished penning her controversial new book, The Book of Sahra, Jesus’ Secret Wife, I jumped at the chance. I’m loving my new interview series, and Rev. Dr. Sahra Renata’s book sounds fascinating. I do not identify with one particular religion, but regardless of your religious leanings, there is no denying that there was once a man named Jesus. This man did not claim to be the son of God, born through immaculate conception, who walked on water and performed miracles like magic tricks and dazzled people into following him, as the Bible would have us believe. This man was an amazing public speaker, who preached of love and forgiveness in a time of great uncertainty. It was a time when Palestine had been invaded by the Romans, and life was harsh. You could be killed or tortured for a variety of misdemeaners and a simple toothache could spell your demise. People followed Jesus because he made them feel safe and loved. His inner light helped them transform their own energy. Jesus was a revolutionary. A leader. Both the Romans and the Jews disliked him because he went against the grain. He was a threat to the hierarchy and he wasn’t afraid of the establishment. He taught freely that forgiveness and love were stronger than fear and greed. I think I can relate to a dude like that. Rev. Dr. Sahra Renata has written a book that goes against everything that the Catholic Church has taught for years, that Christ was a single man. She is even going against New Age believers that Jesus Christ was actually married to Mary Magdalene. For centuries there has been speculation that Jesus and Magdelene were married and had children, thereby creating a lineage that still exists to this very day. There is many supportive writings on this matter with books such as The Holy Blood and the Holy Grail, and even the Da Vinci Code. Although both books are actually classified as works of fiction, they are based greatly on historical hypothesis. In fact, Dan Brown freely admits he just chose 3 controversial and media-grabbing historical topics that would make a good thriller and put them together. What if Jesus, the dude, did have a brood? Now, Sahra has come forward with a new book that claims that Mary Magdalene actually had a twin sister, also named Sahra. She says that Sahra and Jesus wed in secret, and her sister, Mary Magdelene, was a High Priestess who worked by Jesus’ side in his mission. She created a red herring to allow Sahra and Jesus’ children anonymity because they were all smart enough to know that their children would be in grave danger. This tale has more duplicity and deceit than an episode of The Bold and The Beautiful and I was fascinated to hear it’s author tell how she believes that Jesus’ secret wife was actually publically married to King Herod. I bet if Herod knew that he would have been even crankier with Jesus (understatement of the centuries). Holy schnauzer…. she was married to two dudes? Who were enemies? And one supposedly killed the other before he rose again? The bible is unbelievable at the best of times, but this is incredibly juicy. I am fascinated by the possibility that this is the truth. It’s like rewriting the ancient history books. Could it be the biggest cover up that ever was? I was intrigued to know where this new mind-blowing information came from. How did Sahra Renata come across this knowledge? Has she got access to the Vatican’s secret archives or discovered hidden texts, I asked? This information came to her in a much more profound way. Ten years ago, I was given three months to live. I discharged myself from hospital, because I knew that it was between myself and God. One night, I thought I was dying. I made arrangements for my son because I thought I may not see the morning. I prepared every way I could to live, but I surrendered to the possibility of going that night. She told me she thought this night was the end. She describes that night as ‘dancing with death’. As she was flitting in and out of consciousness, she felt herself traveling to another plain. On this plain, a man came to her side and comforted her. He filled me with light, she explained. It was not her time that night, but something had opened up inside her, and over the next ten years Jesus came to her many times, guiding her back through time and he has shown her his story. Rev. Dr. Sahra believes she has resurrected ancient truths by putting it all together. So, you write the story as it comes into your head?, I asked her. The story doesn’t just come to me in words written on a page. I experience the sensations as though it is a movie, and I am one of the characters. I live it. It takes a massive toll on my body and I have even been admitted to hospital after receiving the most important parts of this book. That’s pretty kooky, huh? I mean, K.O.O.K.Y. I believe in psychics, and I believe you can communicate with the other side. I believe celestial beings – angels – and ghosts communicate with us all the time. A song on the radio with a lyric that speaks to you, or some little sign that we are part of a greater thing…. so why not Jesus? He’s just another dude, right? I ask if she ever questioned her sanity? I used to wonder if I was just making it all up. The story was revealed to me very slowly, in pieces, and as it took shape I realised that this was actually my divine heritage. This is my job in this world. Do you think you are blessed, or cursed? This is not the first time someone claims to have received information in this divine manner. The Conversations With God series, by Neale Donald Walsh, have been international best-sellers, and for good reason. His words came ‘through’ him and onto the page. Regardless of how his books came to be on the page the message in them is uplifting. They tell of a loving God and an open minded God who gave us free will, rather than a fire and brimstone Lord who damns people to hell for masturbating or fornicating. I think the biggest thing that The Book of Sahra, Jesus’ Secret Wife and Conversations with God both have in common, is the very fact that if you can simply suspend your disbelief for long enough to read the story, there is much to be obtained by way of enlightening messages held in the text. The Book of Sahra is a love story. It is one woman’s sacred journey and it is an allegory for all humans’ spiritual journey. There is a great underlying message contained within the pages that teaches us to live our lives as our divine selves. It is right. Go forward. Leave behind your old fears. They are no longer your friend. If you would like more information on this book, you can find the website here, and Facebook page here. If you want to purchase a copy, you can get hardcopy on Amazon, or ebook on Kindle, now. Flogging my blog on Friday @ With Some Grace. Fascinating mrs H. I have been intrigued by stories like this, over the years, with a dose of scepticism, on the side. It has created mega debates and deep discussions around my dinner table, let me tell you! !